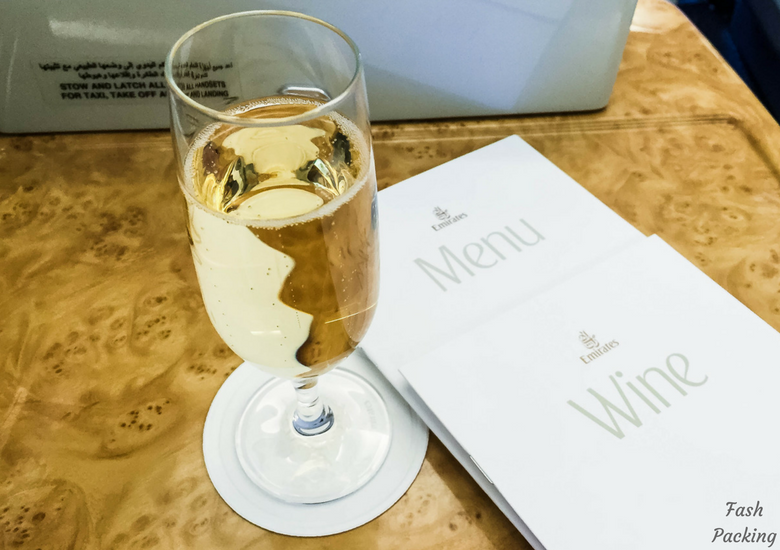 The special privileges start even before you board when you fly on Emirates A380 business class. If you fly any route except the one we chose, you will be transported to and from the airport in chauffeur driven style. I gotta say, I was a little miffed about missing out. On arrival at the airport, a dedicated queue for check in makes the process much less of an ordeal and there was no one in front if us when we arrived. In Sydney, your business class boarding pass comes with an express pass which allows you to avoid the masses exiting the country. 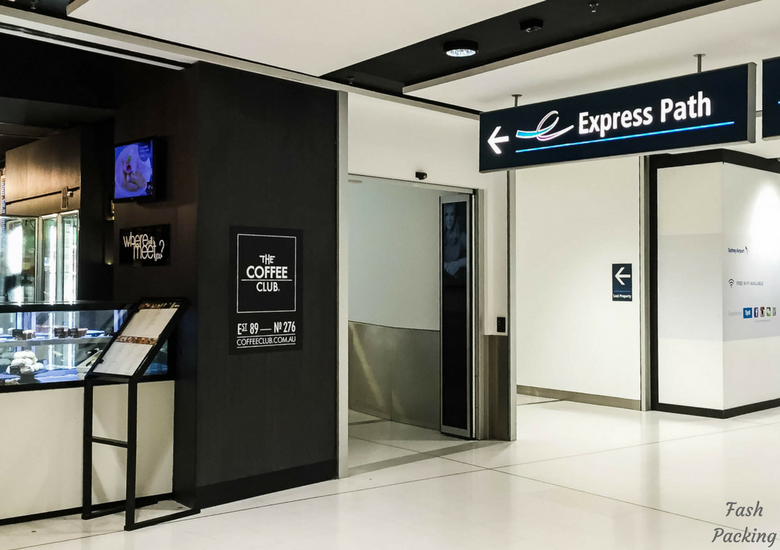 Sydney airport is under going major renovations and the express path entrance is currently near The Coffee Club. 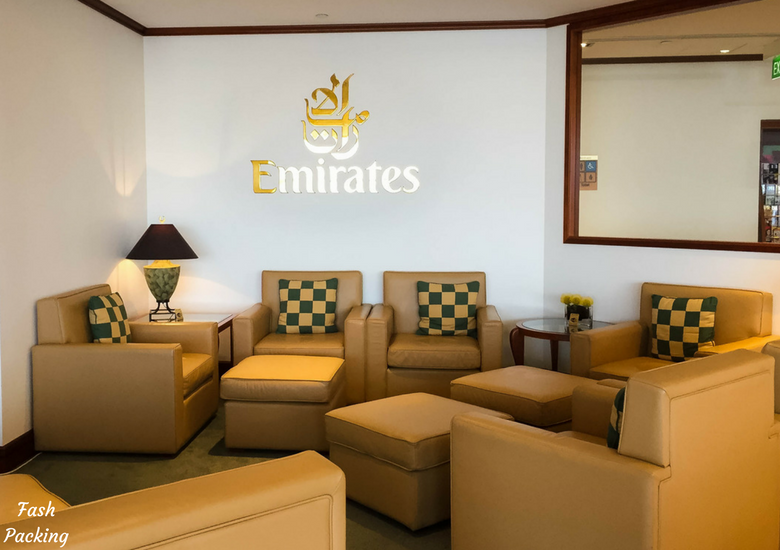 Once you have purchased your duty free and sorted your tax refund head straight to the Emirates Lounge Sydney for a bite to eat and to sample the premium booze before boarding. 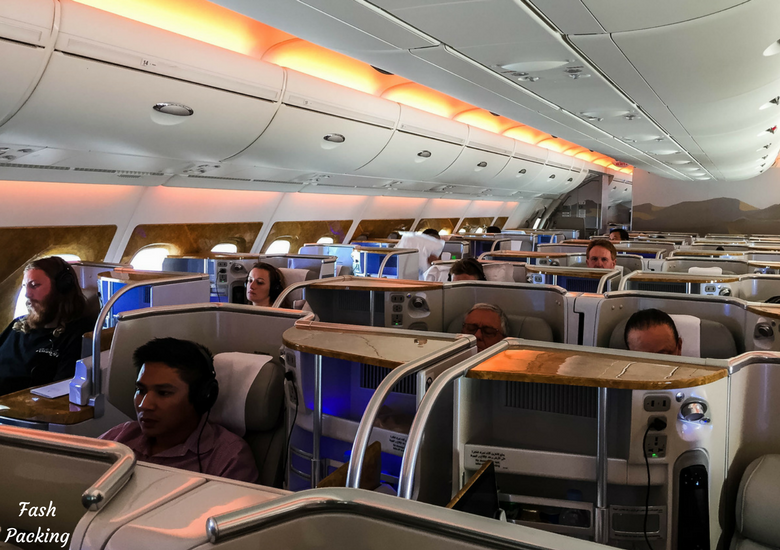 The A380 is the world’s largest passenger airline and boarding that many people is chaos when you are in the economy cabin, but the business class only boarding line makes it a breeze. Emirates have 3 configurations on their A380’s and our version had 76 seats in business at the rear of the upper deck. The seats are cleverly offset and extend under the seat in front to make the most of the space. Each seat reclines to meet up with the foot rest creating a fully flat bed. We chose the ‘couples’ seats in the middle where the seats were closest together with the personal bar on the aisle side. 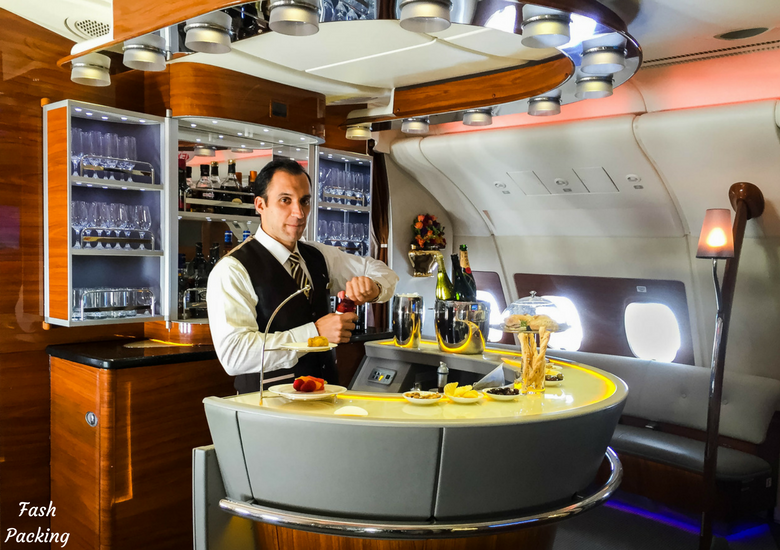 The bar in each seat is a bit of a gimmick as the drinks are not cold and I’m not sure why you would drink a hot juice when you can order a chilled one from your attendant or visit the funky bar at the rear of the cabin. I couldn’t resist stepping behind for a quick pic! 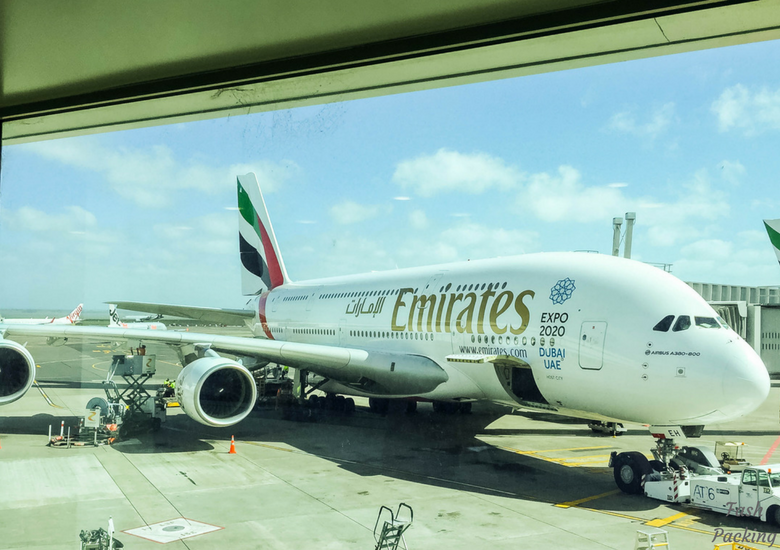 Unlike the out-of-this-world bathrooms when we flew in first class on Emirates A380, the bathrooms in business are your standard airline affair albeit with posher toiletries. 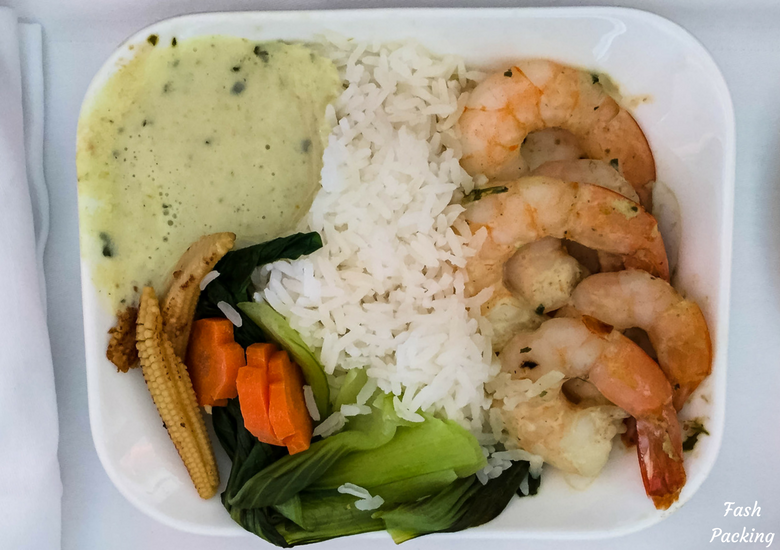 Airline food has a notorious reputation for being appalling at the back of the bus, but airlines have been working hard over the last few years to shake that reputation and give their premium customers restaurant quality fare in the air. 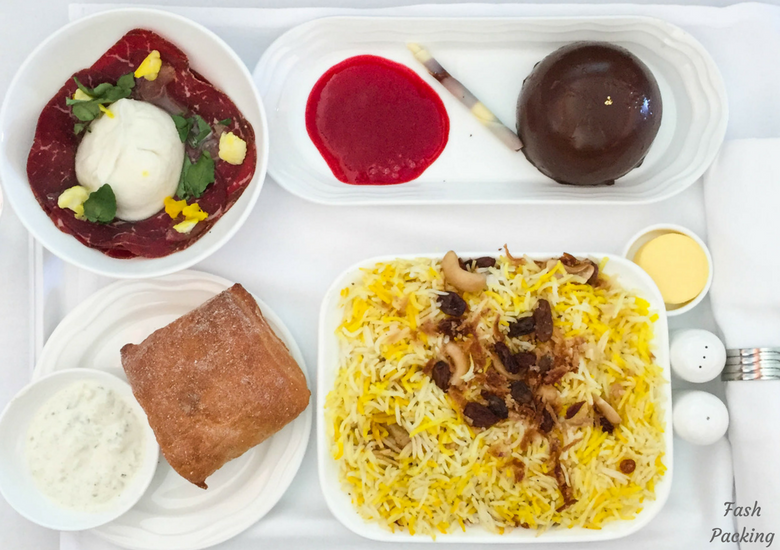 Passengers on Emirates A380 business class can expect monthly menu changes which are designed to showcase local flavours. 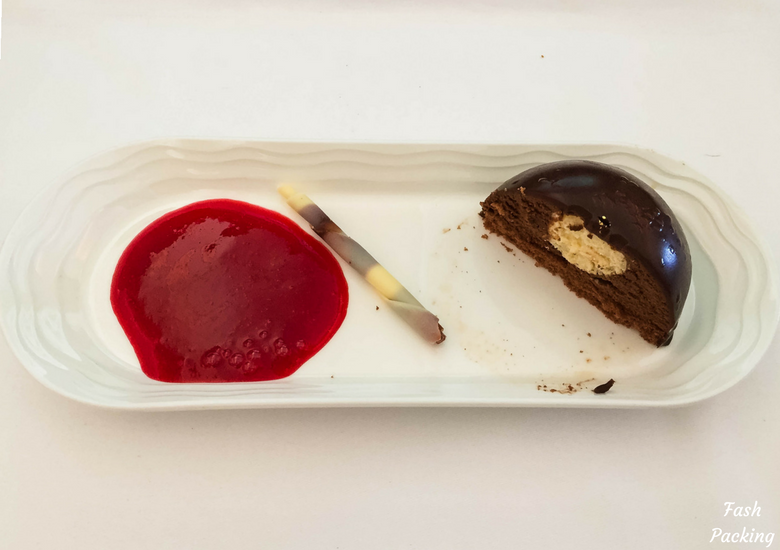 On our flight we were served a three course lunch. All guests was served an entree of Wagyu Bresaola but could choose a main and dessert of their liking. I chose the Chicken Biryani while The Hubs went for the Thai Green Prawn curry and we both opted for the Chocolate and Caramel Dome for dessert. The dessert was the winner of the bunch in my book. Emirates’ ICE (Information, Communication & Entertainment) system will keep guests entertained on even the longest of fights. 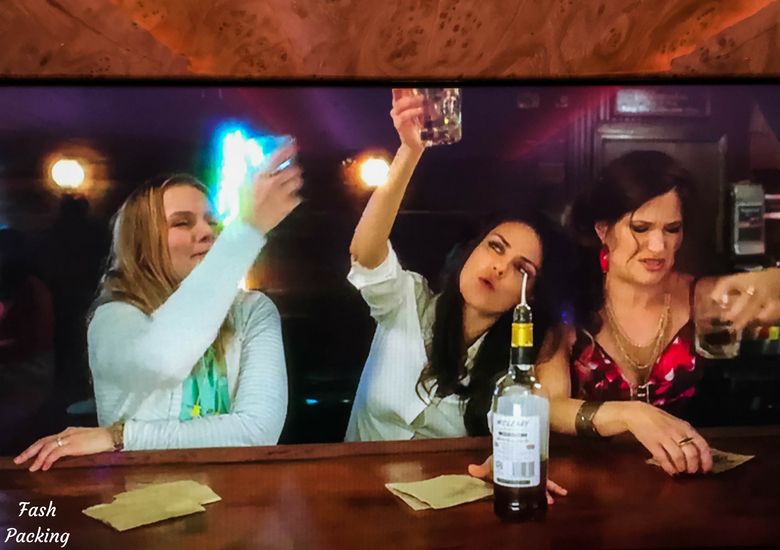 I’d been meaning to catch Bad Moms for ages but never found the time so I was thrilled to find it on the movie menu. I just love Mila Kunis. Noise cancelling headphones come standard but honestly the A380 is whisper quiet anyway so you barely need them. Free in-fight Wifi is still a bit of a rarity but Emirates A380 business class passengers get a complimentary 10MB. It’s only a $1 for a gig after that, but it’s pretty temperamental so I gave up trying after a while. 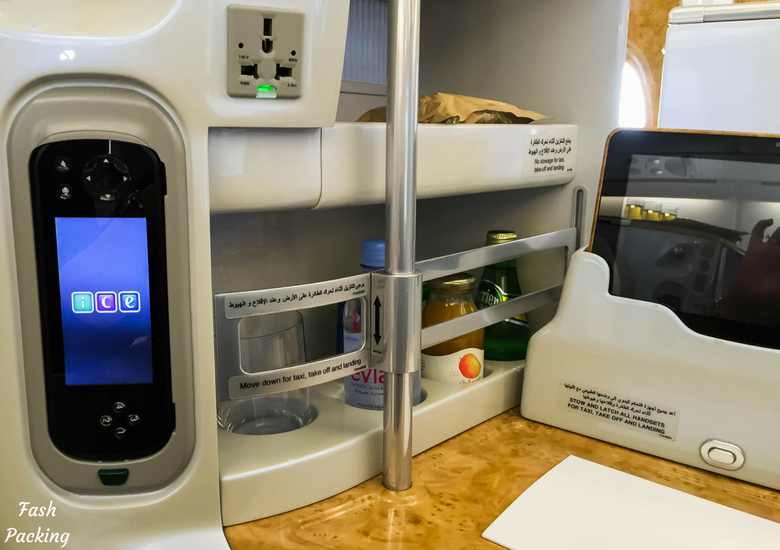 You can even use your own mobile phone on all Emirates A380s. 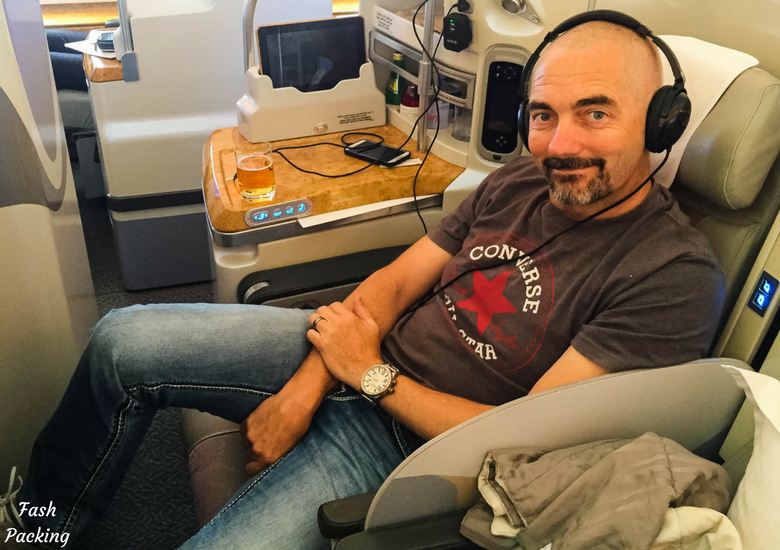 Emirates is clearly a premium airline and their business class offering is head and shoulders above our recent experience on Air Asia X business class trip . 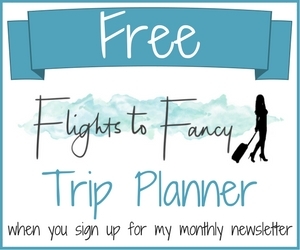 You can check out my other airline reviews here. While I would never shell out the $’s required to fly business, I love using my points to spoil myself. 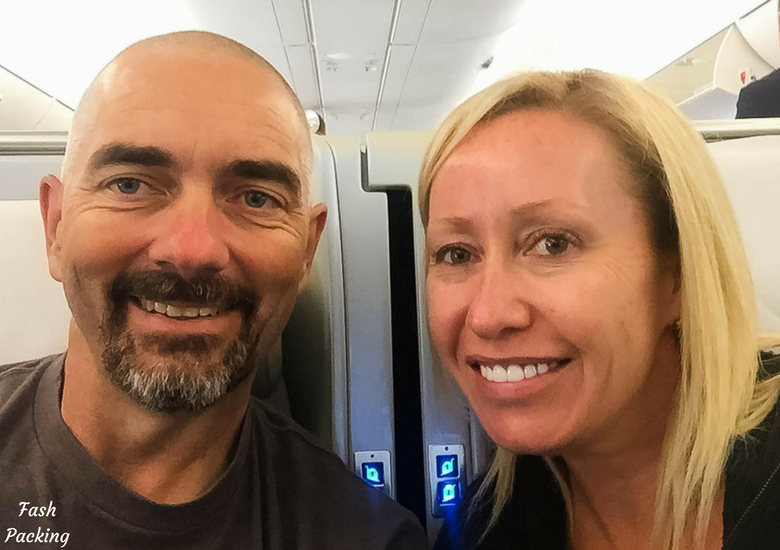 The flight across the ditch en route to our New Zealand road trip was very short so is a great way to sample the service for not a whole lot of points. If you are heading to NZ for the first time you should check out my New Zealand essentials guide which will help you plan an epic trip. 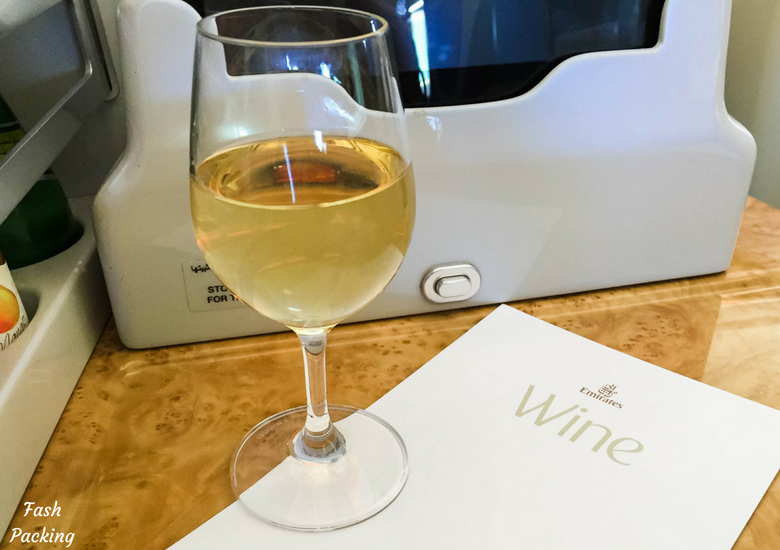 Have you traveled on Emirates A380 business class? I would love to hear about your experience in the comments below. Disclaimer: This post is not sponsored. 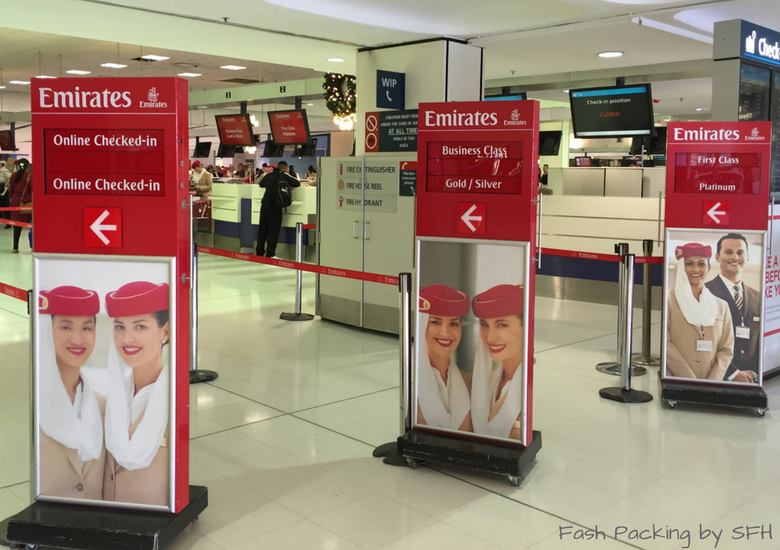 I paid for my Emirates A380 business class flights using frequent flyer points. As always, all opinions are my own. Thanks Divya. Keep saving those points ? Now you’ve got me wondering how to maximise my points so we can do the same! That looks and sounds like an awesome and unforgettable experience! The chocolate dome dessert alone has won me over! :p Bummer you missed out on the chauffeur service – good to know it’s on offer for other flight paths though! I am a point collecting junkie lol. I maximise every trick in the book! My health fund even gives me 10 points for everyday my Fitbit clicks 10,000 steps. I never miss a day. That’s 7300 points a year (The Hubs has one too) without even trying ? 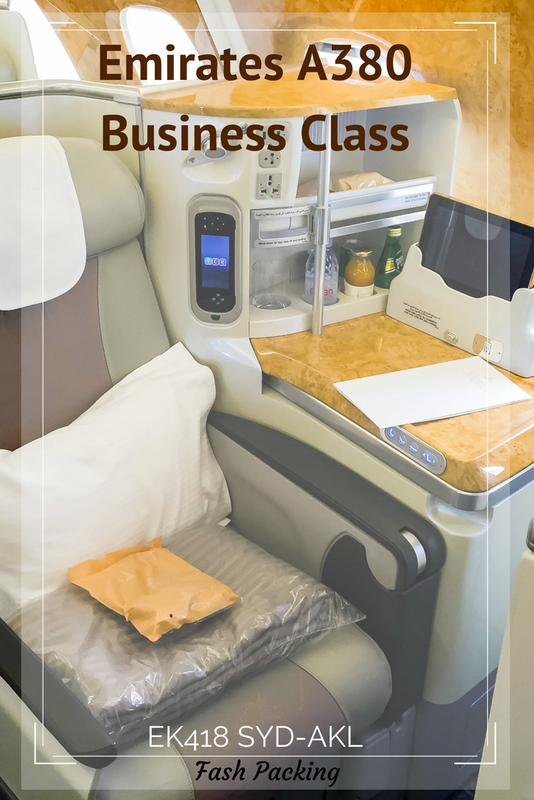 I have traveled on Emirates before, but not on Business class. 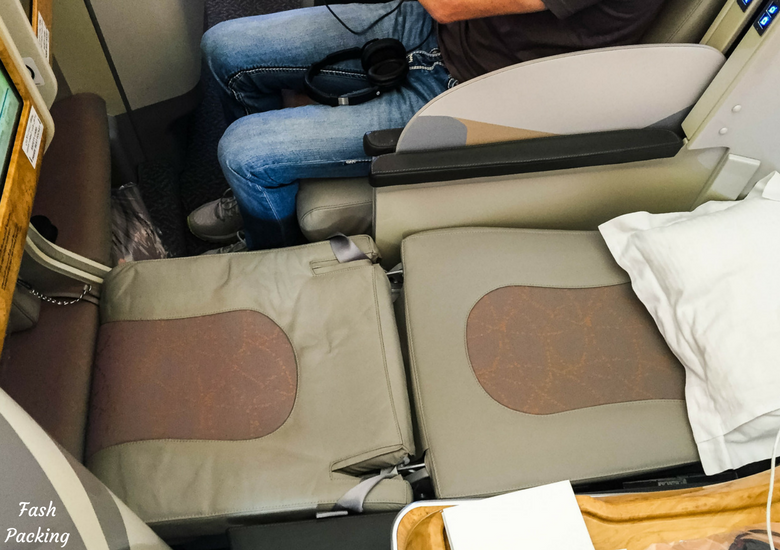 A380 business class sounds worth splurging on. Thanks for sharing! I usually do that too Alice lol. A splurge once in a while is nice though ? I’ve never paid or used points/miles for business class but that does look tempting. What a fab treat! The food and the cocktails both looked great! Yummy 🙂 The A380 is so great as a long haul aircraft, even the economy seat is more spacious than any other we’ve flown. Totally agree. If only I could only fly A380’s everywhere ? OMG that has to be the nicest plane ride I have ever seen! thats for sharing this, i was actually curious be cause I saw ad for them and figured it was going to be nice so I’m glad i got to see your take on it! PS the champange is NECESSARY when flying in style. haha ! kudos! You should see first class Sarah! ? This all looks so luxurious and that footroom solution is genius! I have flown business class yet but hopefully someday! It is actually really cool Grace because it allows more seats to go in without compromising the space! OH my heavens! this looks amazing I want to try this so bad! I hope you get the chance soon Rosie ? I love this post! I’ve never flown on this airline but their advertising is great and makes me want to. I hope you had a great trip. I have to agree with you about the dessert, it looks like a winner! In business class can you have as many desserts as you want? I’d have at least 4-5 of those if this was the case! I’m not sure if I’ve seen Bad Moms yet, I’ll check it out. It must be hard to stay sober, firstly with the drinks in the lounge, then the bar in the seat, or was the bar in the seat only soft drinks? If only I could do that! The real glasses, the leg room and the food brilliant. One day if I win lotto in my dreams. I would take photos too the first I would be upgraded. How can I get this. 76 seats in Business class?! I know the A380s are huge, but my word! Your picture makes it almost look like economy the number of seats there are up there! Obviously when you take a closer look the seats are much more plush and nowhere near what you get in economy. 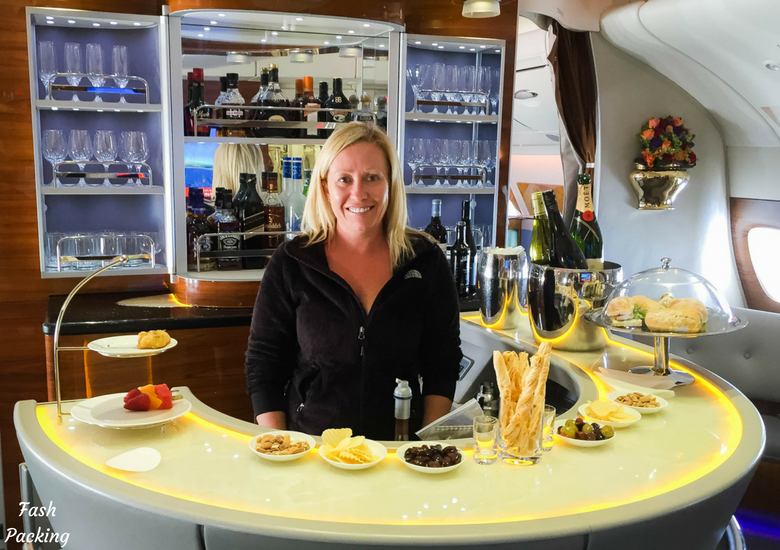 Love the onboard bar too – and the food looked great! This was definitely a good use of your points! This looks and sounds so amazing! I normally fly American Airlines business class, it’s nice, but not like this. 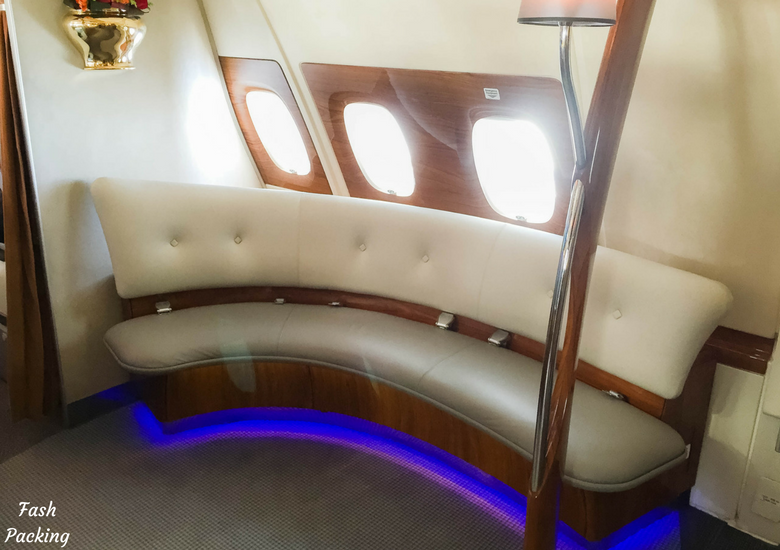 This looks like first class! I’m all about using miles on longer flights too. Love your review, I need to fly Emeritas! You should see the first class in my other review Cathy! Mind blown ? I’ve flown AA quite a bit but never business. 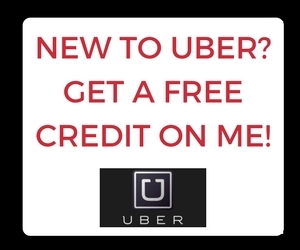 Their economy is pretty basic but they always got me from A to B safely so that’s the main thing! Oh my goodness! What an amazing experience to have. I absolutely LOVE Emirates, even when I am back in cattle class. But to be able to experience Business (AND FIRST CLASS) would be amazing. Your lunch of Chicken Briyani sounds so yummmmmy! And I must say, the dessert sounded good. I love that you have a selection of premium wines and champagnes, like Moet & Chandon. Keep them flowing!!! 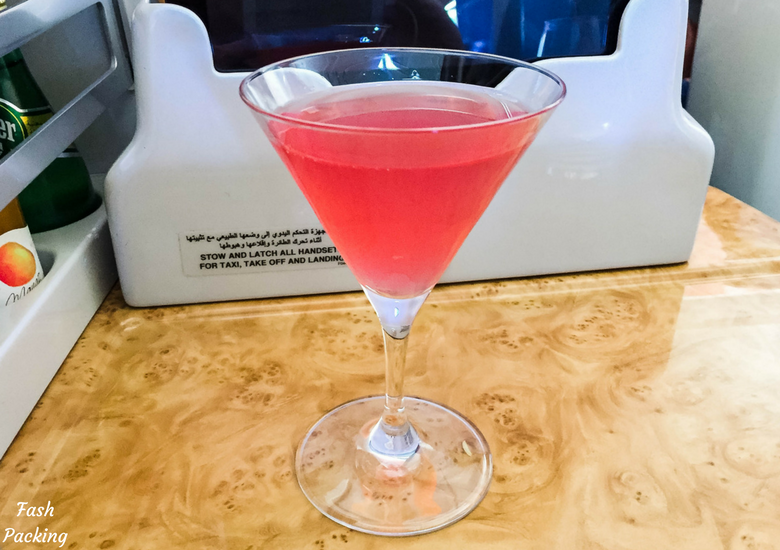 It’s super cool that there is a bar on board as well, because sometimes you just need to get up from your seat and move around…hang out by the bar and get a cocktail. 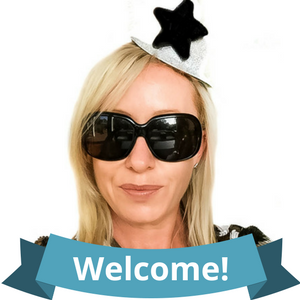 What a wonderful experience you have had! Lucky! Of all the airlines, I like Emirates food the best. Although once I made the mistake of pre-ordering vegan instead of vegetarian (in economy) and ended up having some sort of variation of spinach, mushroom and tomato for every meal. It was a 15 hour flight, so that’s a lot of meals! 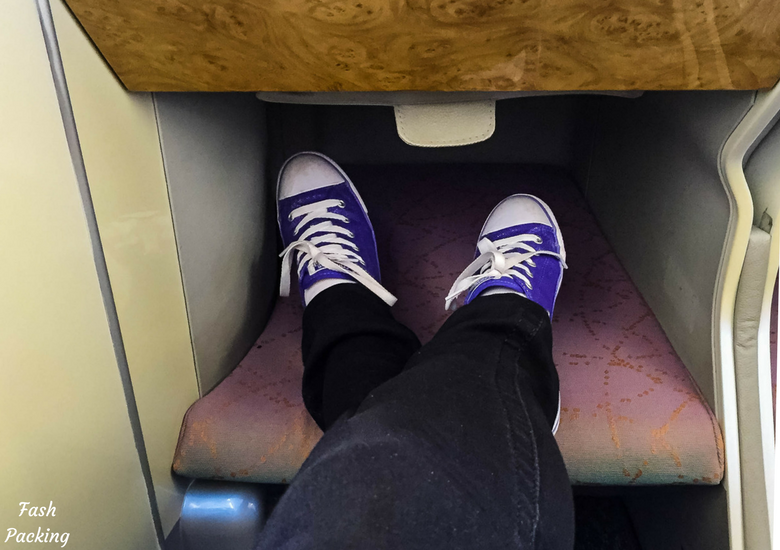 Thanks so much for this look into what it’s like flying business class! You’re a very good writer and your pictures gave me a good sense of what it’s like-as I probably never will get there myself lol. I have flown on an A380 before in economy class and it was the nicest, super smooth flight I have ever been on, so I can only imagine how much nicer an upgraded class would be. Again great writing, I enjoyed the read! Thank you. Never say never, I thought that as well but sneak in a few premier trips every now and then these days. I agree the A380 is sensational. If I could it would be the only way I fly ? Looks so luxurious! That food looks yum! It was pretty good Stephanie ? Thanks for sharing and so glad you were able to use your points and have this amazing experience. I am not a high roller so I rarely get to experiencethis kind of luxury, but now I know that it’s worth it and that if I ever get a chance, I should take it and book with emirates. Thanks! I’m hearing you Kelly that’s why I love using my points to get a little taste of how the other half live lol. This is the shortest route that Emirates fly the A380 on so it was a great taste for not a lot of points outlay comparatively. I remember the first time I was upgrade to an Emirates A380 business class flight, I was going to Paris on a business trip and I just can’t contain my excitement! I started taking photos as soon as I was inside and I’m pretty sure I looked like a lunatic to the normal business class passengers. 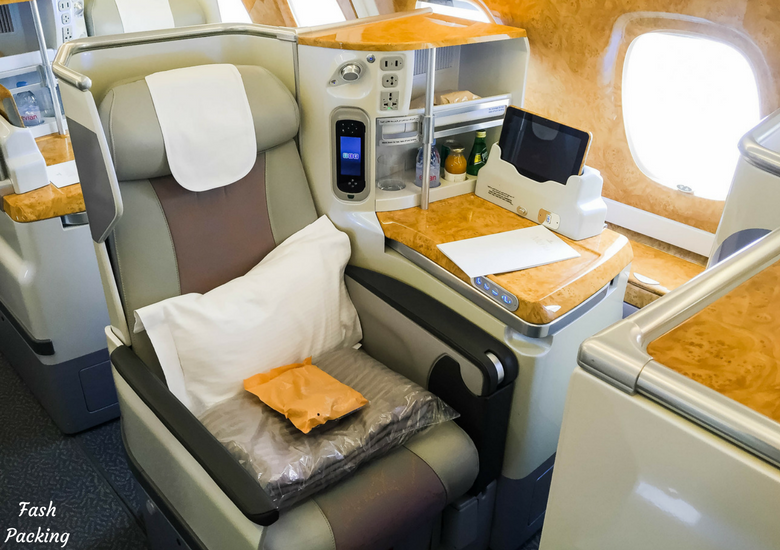 I can never afford the business class fare of Emirates so I am only able to be in it if it’s a business trip or upgraded with my skywards miles. P.S. I’d totally want the flight to go longer than 3 hours if I’m on a business class of A380, I may ask the pilot to make the flight longer. Lol. I totally agree you need more than 3 hours! We were late boarding so they were trying to make up time as well! It was a great taste and I’ll be definitely looking for opportunities for a longer trip in Emirates A380 business class ?